A true touch of nature with this wonderful mix of majestic greens highlighted by subtle splashes of pink. This beautiful and stunning bouquet arrives in water and contains a varied mix of flowers including Lilies, Roses and Alstroemeria. 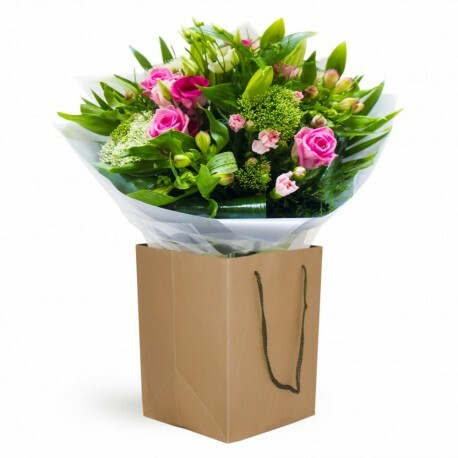 This is a perfect present to give to someone who enjoys flowers and who would appreciate these flowers do not require any further arranging. If you would like an alternative colour scheme, please ensure you ask for this option in the Special Request box. If you wish for the one shown with the pink Roses, you do not need to add anything in the Special Request Box.